We've been busy cleaning out the barn in preparation for spring kidding. This means endless barrels of soiled and rotting hay. Basically the method is simple. Using a pitchfork and shovel, fill 4 barrels. Use the tractor to move the full barrels out to the pasture and dump them. Bring back the empty barrels and repeat. We started this cleanout a couple of weeks ago, and finally! We are seeing FLOOR! I don't have pictures -- it's messy, yukky work. No cameras allowed. We did accomplish some other things this weekend. John and I spent an afternoon straightening the big barn. The motor home had been moved out for a 4 H meeting, so it was a good opportunity to sweep out the floor. 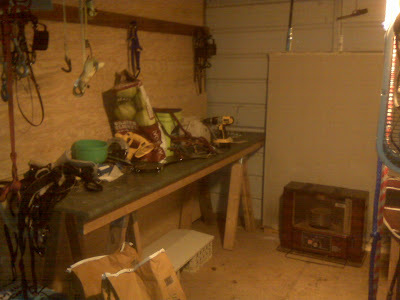 We straightened one of the bays and turned it into a tack/feed room. There is a light hung. 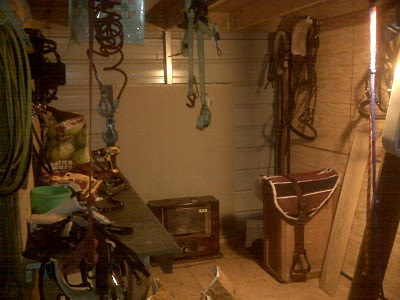 We have hooks for harnesses, headstalls, halters. leads. We have storage for treats and feed. It currently has 3 walls and we are thinking about putting in the fourth wall and a door. Have to wait and see how it goes. Take note of the little heater!